High tunnels help farmers grow more food, and OARDC scientists are helping more farmers use them. Also called hoop houses, high tunnels are simple, low-cost structures that make the growing season longer. Inside, fruits and vegetables ripen earlier in spring and yield later in fall, with no need for fossil-fuel heat. “High tunnels translate into greater food production, greater food security and greater potential farm income,” said OARDC scientist Matt Kleinhenz. At OARDC facilities in Piketon and Wooster, Kleinhenz and Brad Bergefurd, who’s also a scientist with the center, are studying high tunnels, documenting their benefits and refining the best ways to use them. Then, they’re sharing their findings with farmers. Video: Hilfinger talks about high tunnels and the assist she got from OARDC scientists. “We’ve used OARDC’s high tunnel research to increase our impact by providing high-quality produce for more months of the year,” said Dana Hilfinger (pictured in the video and above on the right), farm manager for Urban Farms of Central Ohio, part of the hunger-fighting Mid-Ohio Foodbank. 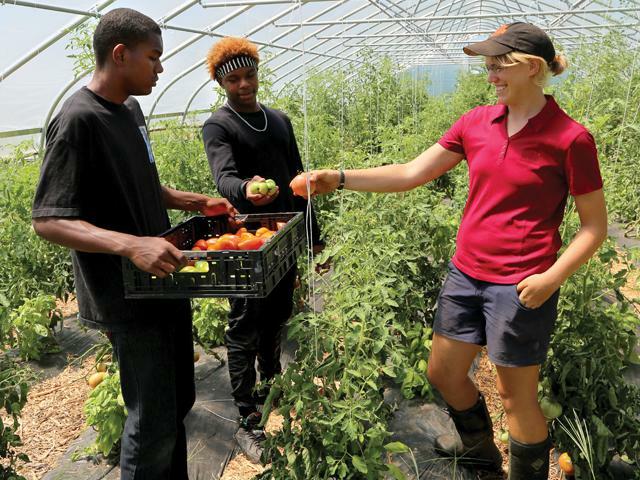 In Ohio, high tunnels can extend a farm’s marketing season from six months to all year-round. High tunnels are especially suited to small and urban farms. High tunnels protect crops from rain, snow, wind, cold and other stresses, including some pests and pathogens. Crops grown in high tunnels often need less fertilizer, irrigation, pesticides and labor. To contact the scientists: Matt Kleinhenz at kleinhenz.1@osu.edu; Brad Bergefurd at bergefurd.1@osu.edu.